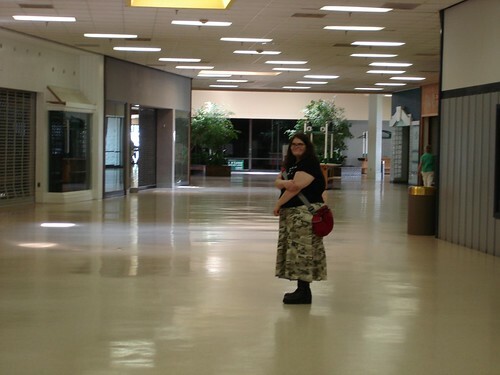 Becker Village Mall (Roanoke Rapids, NC–Dead Since 2002?) | That Mall is sick and that Store is dead! Talk about old school: I can remember when Orange Julius was that gated store on the left in your second photo, and we’d buy 45 RECORDS (I’m talking serious old-school; “The Art of Noise” and “New Kids on the Block” heh heh) at the music store down near the JCPenney end. I’m surprised that the mall didn’t begin its death throes when Walmart moved right down the street, though it may have. I went home a few weeks ago and JCPenney’s still hanging on. There was this awful acrid, closed-in smell all around, like a furnace that’s just turned on, that hasn’t been there before. I feel a pang of sadness when I see what’s left of Giovanni’s, though…..
there at some time or other. A lot of people use it for exercise walking now. Refering to the sign by the bathroom hallway. 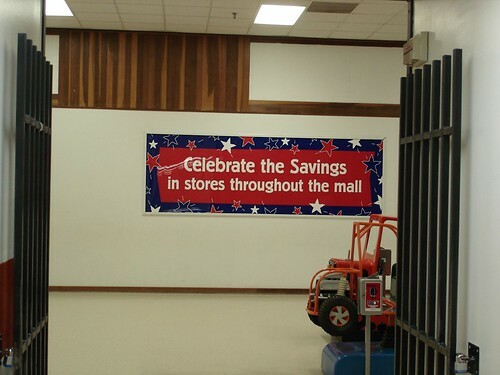 Yes, Most of the stores are shut down, saving money on their electricity bill gives them good reason to celebrate! Ahhh… Giovanni’s…. the best place in town for pizza and the friday night hangout for all of us at one time or another….. That and the pet store closed down when Robert (the owner) had a fatal heart attack….that was a very sad day, everyone knew Robert and he was a great man…. It’s sad to see Becker Village Mall the way it is today. It is half past dead. I used to beg my grandma to take me to the mall every friday. It was the hang out spot all the way up until after I graduated from high school. Giovanni’s had the best pizza! I miss the place that it used to be. The new mall is Wal-mart Super-Center. Wow. That mall was the reason my Mom and I moved to Roanoke Rapids, NC in 1979. The mall was just opening then and my Mom was regional manager for a store called “Fashion Bug”. I have alot of memories from that mall as I was only 8 years old at the time, and I lived there until the age of 18, moving away in 1990. I remember walking around in the mall when it was under construction. Mom’s store was directly across from the Giovanni’s pizza spot, so I ate there alot. And there was an Arcade in the spot left of Giovanni’s. 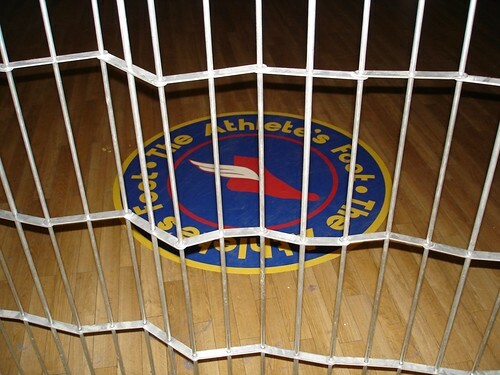 Alot of memories…sad to see that place in that condition. Hard to believe. I knew the mall was not very busy anymore but WOW! My first job was at Giovannis. The Gold Mine right next store, Coto’s right across.. K-mart…So sad!! I used to go to this mall when I was growing up. We lived in South Hill, VA and it was about 45 mins away. It was small but at least they had one, South Hill doesn’t even have one. We used to go to a mall in Henderson, NC not far away that was smaller than this…it’s about dead too if not already. How sad. My son had his first haircut at that mall. We moved away in 96-97. It’s so sad to see all the smaller businesses going away. Most of the stores have moved to a strip mall located beside walmart. I was at the mall recently, and it seems like it is really turning around. I heard it has new owners who have big plans for the mall. They must be doing a great job because there are definitely new retailers open. I especially enjoyed Country Treasures! Also, I have been out to the Wal-Mart center, and I have to say that I felt much safer shopping in the Mall where there is full-time security then I did at the Wal-Mart center. I am looking forward to what will happen at the mall next! I was in Becker Village Mall earlier this week. The Mall is coming back to life with a number of new and interesting shops. In addition to JCPenny, the Mall has Hit Wear, Bella Vita Salon, Purse-N-Alities, Country Treasures (looks better than most Hallmark Gold Crown Stores), Java Joes, Just for You, Kidz Korner, some Mall Kiosk vendors and even a dancing Easter Bunny. For you history buffs, there is a large Dallas Jones Veteran’s Museum, and some non traditional tenants like H&R Block and Health Links. Yes, the Mall is old and there are quite a few empty stores, but, this Mall is adding new stores and not fading away. Perhaps we could all consider looking at the positive side of these old community malls. Hey, just wanted to update you on the mall. 🙂 The guy who posted before me was really recent. I now work at the store Country Treasures he was speaking of, now known as the Gift Gallery & Gourmet Shop. Now we have a martial arts studio, Curves fitness for women has moved in, and an arcade is coming back in. The worst thing that is happening, however, is Wal*Mart has purchased the old K-Mart building and is going to use it as a STORAGE WAREHOUSE. I am so angry that the owners would let them do this, instead of bringing in a real business to help out the mall. If Wal-Mart is temporarily leasing unused space in the Mall….then that means the Mall owners will have income to put into the Mall & current tenants. Income from a strong and steady source (even if temporary) will only serve to help the Mall, and therefore the stores and employees in the mall as well. I hear that several events and improvements have been planned for this mall~ and the Wal-Mart income helps support those. I think leasing to Wal-Mart is a creative way to utilize the space on a temporary basis until the national retailers start loosening their purse strings again and do some new stores. Kudos to the one who thought of it! The Mall now features a free concert every Sunday at two pm! They are also inviting in Many Non-profits to put on show and it is working! I went to a cool comic book and toy show in November! 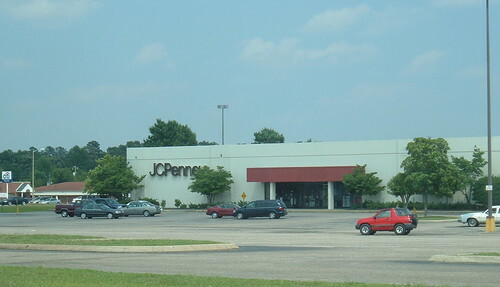 becker village mall has lost all those stores except JC Penny. Ma and Pop stores have come and gone. This is mostly due to the owners of the mall. If it loses money then it is a big tax write off. There is an arcade and a sub shop there now. but they (mall owners) are trying to make them move. There is a bridal shop and photo studio coming. they need to go ahead and close the doors. average people would like to see it grow but in the city poltics rule. they should remember the customers and not there own egos. There are many events held at BVM, most recently a couple of Cub Scout Pinewood derbies. There is also a Scouting fair being planned for the near future. 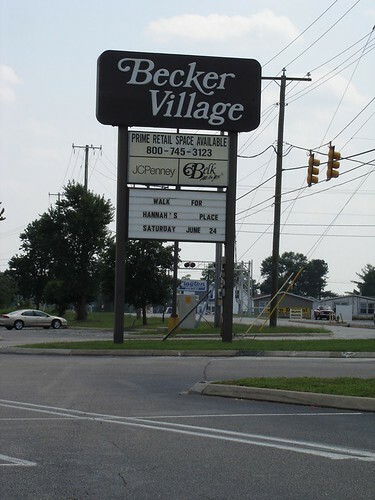 I agree, we should look on the bright side and hope for the best for Becker Village Mall. Losing the family arcade at Becker Village Mall was probably a death-shot to an almost dead mall. On Saturdays, that place was rockin’! It usually had 60-70 people…with NO ONE in the mall. Now the arcade is gone. Who else will they run away? Rumor has it that there are some big name stores coming. 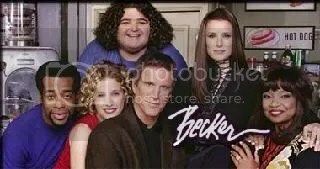 They even have a website now http://beckervillagemall.com and are undergoing a ton rennovations. I was the Manager of the Radio Shack during the malls hay days. We saw the writing on the wall the minute K-Mart decided not to renue their lease. I went from writing 2500 tickets a month to 1200 a month. Radio Shack is now next to Wal Mart in the new plaza. The floor plan you have the pdf for isn’t really THAT dated, which makes it all the worse. *lol* I grew up in that place. Giovanni’s Pizza was the BEST!! It was right beside the arcade (one time Gold Mine and then The Tilt) and K-Mart was my first good job in RoRap as a teen-ager at age 16!! The place was always “dated”. The main problem at the time is that it was owned by people in NY and they charged the going NY mall rates for a small town in NC. Stores that could afford to be there couldn’t turn decent profits, and meanwhile, other stores floated in for weeks, months and even DAYS at a time. In my opinion, Wal-Mart, the high rent costs of a parcel in the mall, and K-Mart leaving were BIG plays on what killed it. I miss Walden Books, it was the only store my dad would buy me anything out of. And the pet store. And Bath&Body Works, the old Hallmark, and FYE. I really miss this place. I remember Christmas time there and all the decorations and the crowds of people hurrying to do that last minute shopping. K-mart staying open 24 hours for all the Christmas shoppers and having the blue light special sales. The gold mine is a part of every kids memory from back then and yes Giovani’s had the best pizza around. The elderly people loved to go sit around on the benches in the halls and watch others throughout and socialize. There was a camalot music store, fashion bug, cato, belk, jc penneys, maurices, peanut shack, several jewelry stores. I can remember going to the book store trying to locate tom sawyer book needed for school. Mr. c’s hair salon. the drug store next to belks. the nail salon. I even remember they use to have a haunted house for Halloween. My god soo many memories. I miss this place and i can say i guarantee if this mall was reopened with stores like it use to be that more people would come. It was nice to go shopping and go from one store to the next without going out in the rain or snow or heat. it was all indoors and it was great. i hate the new premier landing strip. i dont even go to half of the stores there like i did when they were in the mall and i never never go from one store to the next there. I have been to maybe 3 stores at premier landing since all has moved out there. when I went to the mall I never went to only one store when i went shopping, i would check them all out. I hope one day someone will see the mall and let it shine again as it use to. as of now it is a dead scene, nothing interesting in there. I can remember when the mall was being built. It did have a lot of great stores. I miss it a lot when Kmart closed, It was a place you go in Roanoke Rapids and be able to see people, talk for a bit, visit. I think it’s sad that it has come to what it is now. Hopefully, it can be saved and some life be brought back to it. I lived in Roanoke Rapids for a number of years in the 90s (middle and early high school) and this place used to be pretty good. I met up with my then-future girlfriend a year or two after leaving and it was already on the decline then – in 2000, some time before K-Mart closed. I know that the new shopping center off of I-95 drew most of the store owners away too. The local owners that bought it have had limited and ultimately poor success. I used to love going to the mall with a $10 bill in hand. $5 for games at The Gold Mine video arcade, and $5 to get pizza and a soda at Giovanni’s! BUt when K-Mart closed its doors and left the town, the mall soon met its quick demise. Originally, I believe the owners were people from New York state, who charged ungodly rent in a small town mall based on then current NY state mall prices! THe company that was doing the leasing in Charlotte NC, billed it as being local to Carolina Crossroads; “a world class outdoor” music venue. Carolina Crossroads and The Roanoke Rapids Theater have both been HUGE FAILURES. And Becker Village Mall is now a laughing matter of a “retail center”. The current owners are indeed local, and also own other “successful” businesses in town. The problem is their lack of ability and attempts to pull national chain stores to the mall. Instead, it became a “flea market” thing for them to allow their friends and relatives open up what they call boutiques, and the rest of us that have braved the stench of that place know as JUNK VENDORS. A “high end” consignment shop boasts sales of “gently used items…. they fail to mention that they are gently used for a few years, and barely discounted off the original retail price the owners paid for them! I spotted a nice Bulova watch in the jewelry counter, and it was in great shape. It was a 3 year old model, and the asking price….. $350!!!! I did some checking as that didn’t seem quite right or near correct. It sold for $375 4 years earlier!! BVM has died, and in the era of strip malls and outlet malls that we are now in, I doubt we see it return to anything NEAR its height of glory it saw in the late 80’s and early 90’s…. BUT HEY!! You can always go in there and take your kids to the Bounce N Bounce!! It’s a redneck in-door bounce house place now, where once stood the Ben Franklin Crafts store that I worked at in my late teens. Sad to see the once thriving mall as an eye sore now, but I think it would be better off to return it to the corn field it once was!! Ahhh, the memories. The Gold Mine, Giovanni’s. Then off to the theater or the skating rink (Is that still there?) Maybe skipping Giovanni’s and hitting Popeyes instead. I bought more music and books in that mall than I can even begin to recall. And found out years later I actually chatted up my ex wife in that mall, years before we “met”. Also worth noting for the humor aspect that in Southside Virginia where I lived, it wasn’t pronounced “Roanoke Rapids”. It was pronounced “Ronokrappits”. Another question: Is there still a Kraft paper mill in town? I’ll forever associate Roanoke Rapids with the smell of that place. PEEE-YEEEEW! Yes, @Jay Carter, the paper mill is still going strong. If it wasn’t for the mill this town would be even more pitiful. As of June 2013, JC Penney’s is holding on my the hair of its chin, there is a barber shop, hair salon, a bounce and play business for kids and that’s about it. Yes, I remember how many of the elders would come to chill on the benches by Kmart. I really miss the sense of community that existed when the mall was there. I remember when downtown RR was thriving, too. Haha, JCPenney’s is going out of business and that’s how I found your post. Belk has been gone, it relocated to the strip mall across town with the new Walmart. I’m from Roanoke Rapids, and back in the day (98-01) it was where teens used to walk around if they were too young to drive, or loiter in the the parking lot if they could. It was called the Sonic 500… drive to Sonic Drive-Thru, drive through the mall, repeat, until you saw your friends and then parked and did various juvenile delinquent-y things. 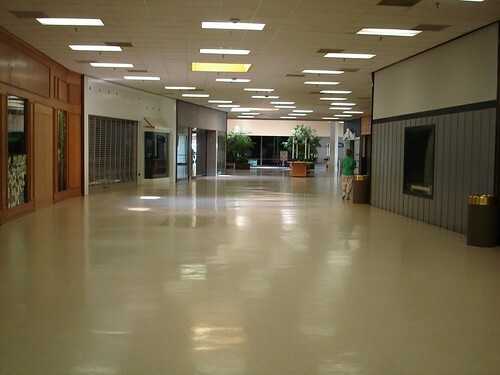 I actually had my first kiss in the K-Mart, have a pic of it too (ha), and it’s true that’s what killed the mall. Now, the only thing keeping it from being a complete graveyard is a new children’s birthday party place. This is a fairly outdated post. The Belk left in around 2004 and went to the new complex where WalMart is now. Claire’s and Hibbet Sports moved to the Walmart complex, but Claire’s has been closed for a few years. I think Shoe Dept. moved somewhere else, Hitwear has been closed for years and I have no idea what happened to Master Cuts. 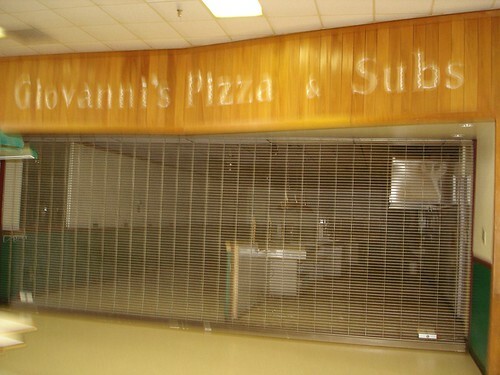 I remember the K-Mart and Giovanni’s, but they both closed when I was very young. Some more stuff has come through since this post. A restaurant called “The Grill” opened where Giovanni’s was and closed about a year later. Two consignment stores (that lasted for a few years but then closed), a Bouncy Castle place (that before was an arcade), the Veteran’s Museum, Bella Vita’s hair salon (got replaced with a different salon, a Mary Kay makeup shop, Java Joe’s (which was a snack/ coffee shop place that lasted for a few years but is not closed), a ribbon wreath store (I’m not sure if that’s there anymore. I haven’t been to the mall in a few months), a door store (that’s never open and the sign is made of painter’s tape), a barber’s shop (I think it’s closed), a nice dress shop (I think that’s closed), and a sportsware shop (that’s been closed for years). The mall went through a small revival a few years ago but it didn’t last. The lady that owned it sold it to a company based out of New Jersey a few years ago.